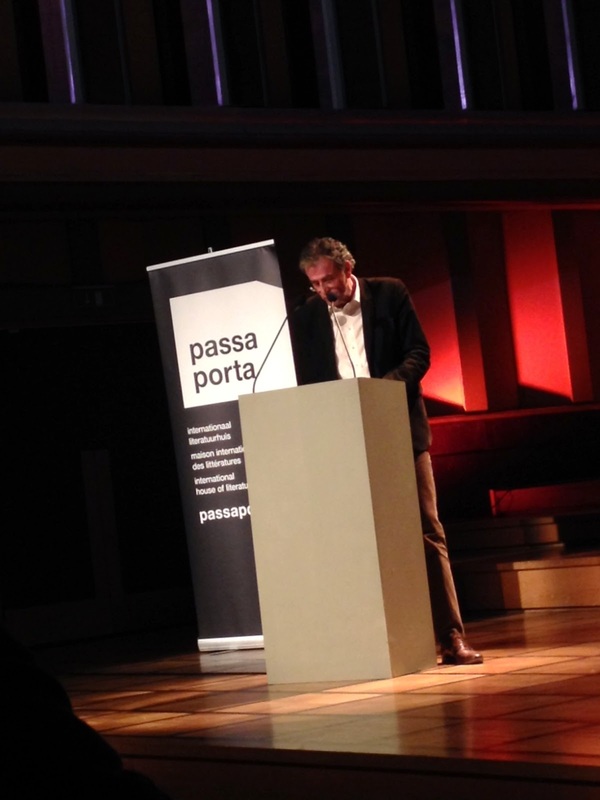 Authors and literary translators blog for Passa Porta, the international house of literature in Brussels. / Journal de bord pour les écrivains et traducteurs littéraires à la maison internationale des littératures Passa Porta à Bruxelles. Auteurs en vertalers bloggen voor het internationale literatuurhuis Passa Porta in Brussel. Humans are singularly touched by time — haunted in the present by echoes from the future recalling traces of the past. The medium of that haunting is not the flow of life but the teletechnological stutter of symbols stitching stuff into history. What distinguishes and indeed divorces history from the uninterrupted flow of life is the crisis of decision: the choice for a future that cannot be predicted as an extension of the present, yet which depends on the performance of this choice as its condition of possibility. 10:00 a.m. ticks by. The sturdy round table around which we've been gathering for the past three days is vacant, save a stack of books. Their authors linger on the patio, talking and enjoying the morning sun. A camaraderie has formed, and it is stronger than a clock. Eventually, the final session convenes, a discussion begins, ends. 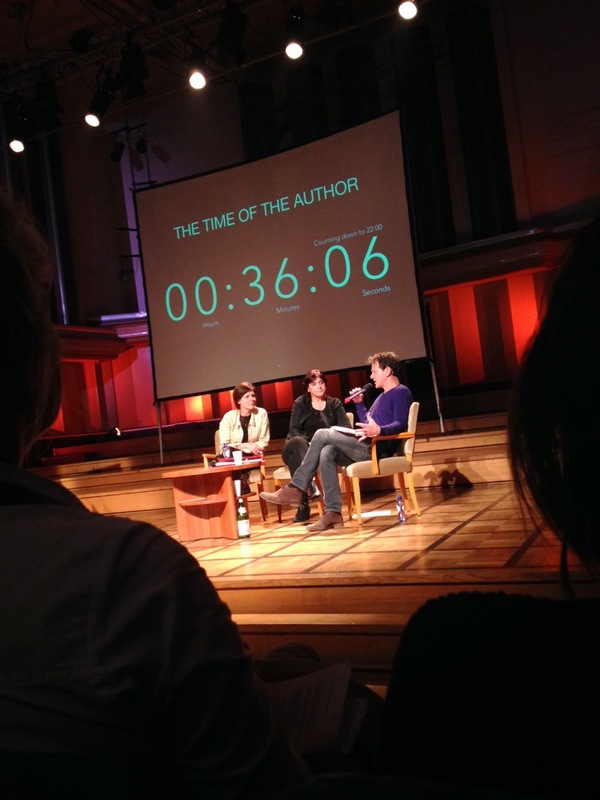 Our authors turn their attention to the evening’s event in Flagey. Their task: to share the special time spent over the past three days with the public. How will they ever manage that? “The great art of writing is the art of making people real to themselves with words,” reads Jens Christian to an audience of 200+. Our seven writers spend the evening doing just that: an excerpt from Juan Gabriel’s thought-provoking keynote, “Getting Poems from the News”; a conversation between Goce and Céline about giving voice to the nameless and forgotten through historical and contemporary fiction; a ‘stand-up philosophy’ session from Joke calling our consciousness to the creative time of Kairos; a conversation between Anne and Iman about seeking answers and finding questions; an excerpt from Jens Christian’s masterful keynote, “News and the Writer” – all tied together by moderator Ortwin. 10:00 p.m. ticks by and The Time of the Author ends. I am reminded of Céline’s reflection on Jens Christian’s keynote during the morning’s discussion: “What if the art of writing is the art of making the writer real to himself with words?” After three days of sharing words – spoken, read, written – with one another (not to mention meals, bathrooms and many bottles of red wine), I find gratitude and comfort in that thought, and I hope it to be true. 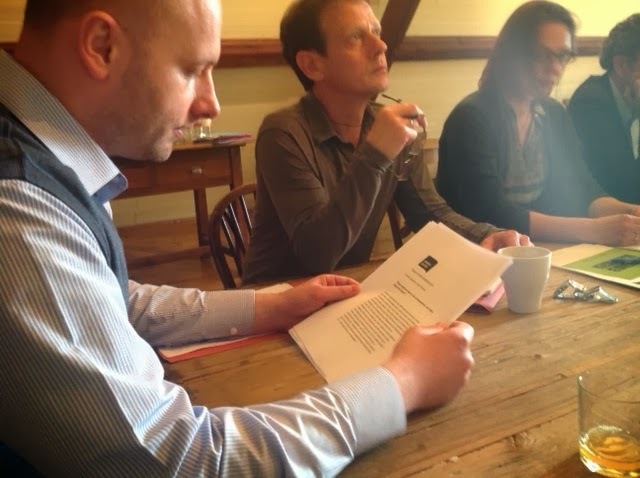 Check back in two weeks for the final report on ‘The Time of the Author’. Day Two: Time for authority? We are more than halfway through our time here at beautiful Villa Hellebosch, and, like a plot unfolding, storylines have begun to emerge. One such storyline: authority. Should the writer unabashedly embrace her authority and use it to be a moral beacon in society? Should she strive to cultivate an honest authority, or use her authority to expose its own weaknesses and ambiguities? Is writing with a certain authority inevitable? What of gendered authority? For our seven authors, the time to discuss (their own) authority is now. A lofty, thorny conviction, no doubt. But this challenge has found resonance among the group in interesting ways. The keynotes, readings and subsequent discussions over the past two days have explored this question from many angles. Juan Gabriel points out that Latin American authors have an authority that carries with it both respect and politicality. This is an inevitable authority, and one that should be claimed by novelists if they – and not politicians – are to be the ones to write the narrative of their times. But this response is not a retreat, says Goce, invoking his concept of all-timeness. “Our stories are not going to last forever, but something should be so essential to existence in them that they communicate for all time. The simplest of simple stories can do that.” But how, asks Céline. Maybe that’s the writer’s beacon. Maybe that’s the source of her authority. 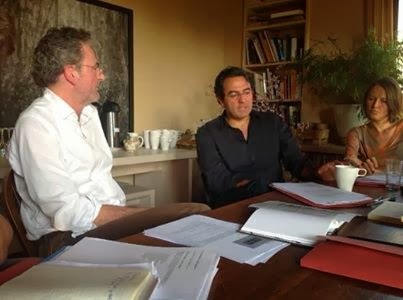 Hear more tonight, when Céline, Joke, Iman, Jens Christian, Anne, Goce and Juan Gabriel open the writers’ circle they’ve nurtured here at Villa Hellebosch to the public – and the reader. Don’t miss “The Time of the Author” tonight at 8:15 pm at Flagey. 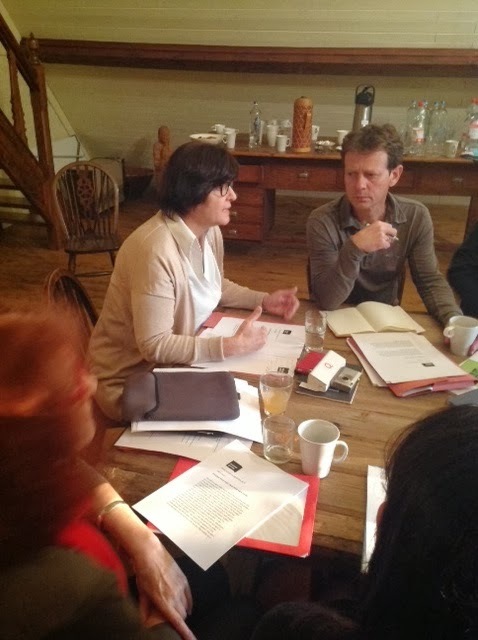 Discussing the role of the news in Céline Curiol's excerpt from her novel "Voice Over", on day two of the Passa Porta's writers' Seminar. 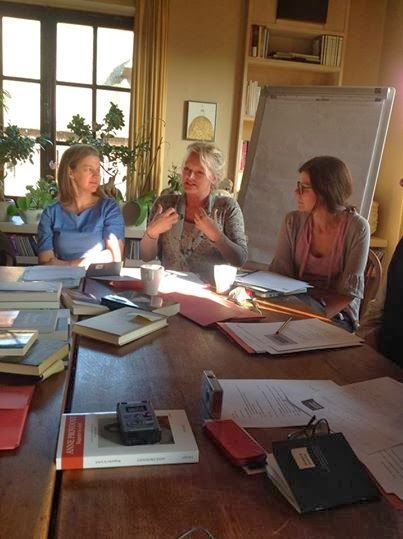 Discussing Anne Provoost's keynote "Is the time of the author in sync with that of the world he or she is living in?" Upstairs: discussing Goce Smilevski's keynote 'Does literature have to be contemporary, and what does that mean?' 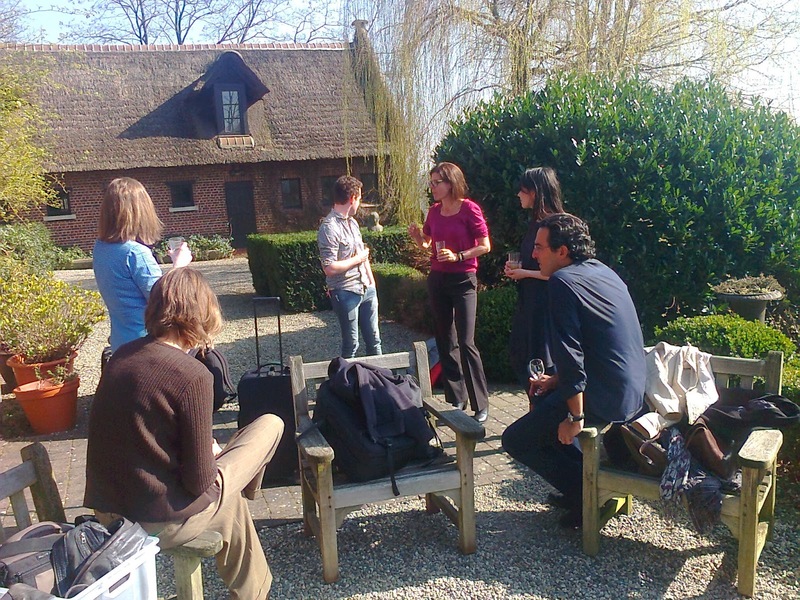 with Belgian authors and critics. Iman Humaydan presenting excerpts from her book 'Other Lives'. The tour bus carrying seven internationally renowned writers and four Passa Porta staffers rolls to a stop at the gates of Villa Hellebosch in Vollezele. A summerlike sun warms shoulders clad for late winter, shrugging. A thatched roof and gabled windows can just be gleamed at the end of the tree-lined drive. It seems we’ve arrived at a writers’ paradise (or a scene out of an Agatha Christie novel?) where the sun is always shining and time stands still. 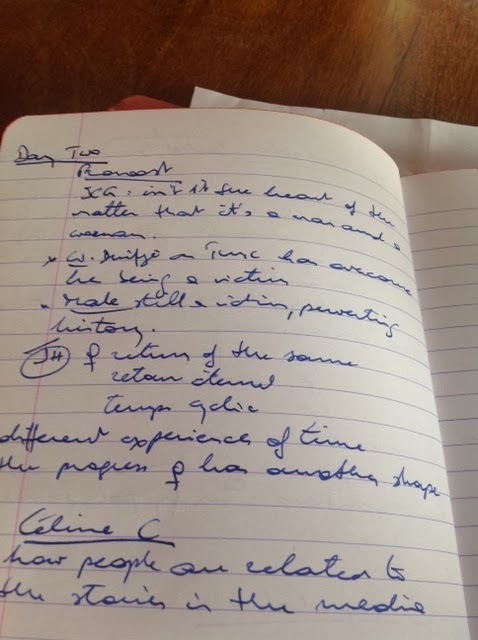 Here, “The Time of the Author” begins. Monday, 10 March. 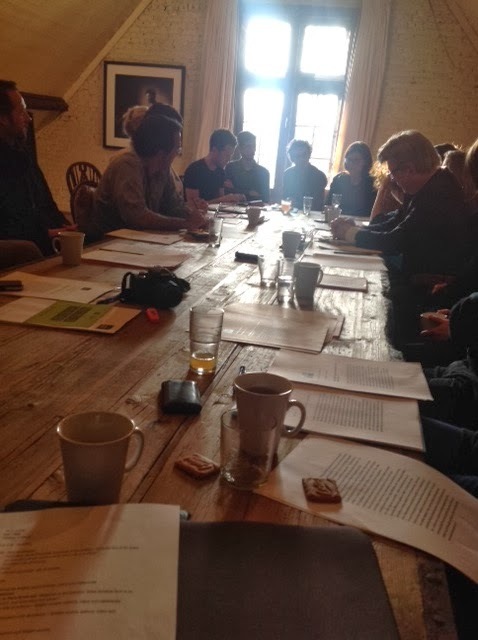 Day One of the three-day writers’ retreat. Céline Curiol (France), Joke Hermsen (Netherlands), Iman Humaydan (Lebanon), Jens Christian Grøndahl (Denmark), Anne Provoost (Belgium), Goce Smilevski (Macedonia) and Juan Gabriel Vásquez (Columbia) settle in for conversation and reflection on the gathering’s focus: the relationship between the literary imagination and current affairs, along with readings from their work. Wading us into our allotted time, moderator Ortwin De Graef invites each writer to introduce him or herself, say why they have come and what they hope to get out of the retreat. It does not take long for lines of thought to emerge, overlap, find resonance. Juan Gabriel, a novelist and columnist, calls out the tension between the role of the columnist, who writes of the present as someone who knows and tries to convince, and the role of the novelist on the other, who writes of the past as someone who does not know. Céline Curiol, who spent ten years as a journalist, asks what is news? Is news new? How should novelists use it? She points out that news is becoming more and more fictionalized while novels are becoming more and more ‘realistic’. 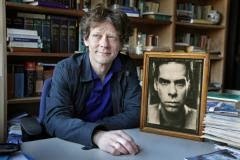 Joke Hermsen, a writer and philosopher, is skeptical of time and is interested in alternative models and ways of thinking about it. Her new book explores Kairos, whose time is that of the right or opportune moment. She senses shimmers of this time in a world dominated by the linear, ever scarce and ever-accelerating time of Chronos. Goce Smilevski’s historiographical writing (e.g. Freud’s Sister) is concerned with remembering characters from history that were left behind, in the shadows of its giants. He, like Joke, senses a shift in the last few decades. “We have the resurrection of Kairos that Joke mentioned – the time of the time is coming again." “I have a traumatic relationship with time,” says Iman. “I see time as a masculine thing because all these traumatic events in my life have happened by men.” The time of women is outside history for Iman. Writing about women has enabled her to write in the present, but a distrust of reality and time remains. “I am here to come nearer to a peaceful relationship with time,” she says. Plenty of time to ponder these and more questions in the days to come. Yesterday 10 March, Columbian author Juan Gabriel Vásquez opened the first Passa Porta Seminar on "The Time of the Author" with a keynote answering the question "How does the writer relate to the news that he or she never entirely has under control, the news that we call "current affairs", "today's world" and "our time"? From left to right: Jens Christian Grøndahl, Juan Gabriel Vásquez and Céline Curiol. 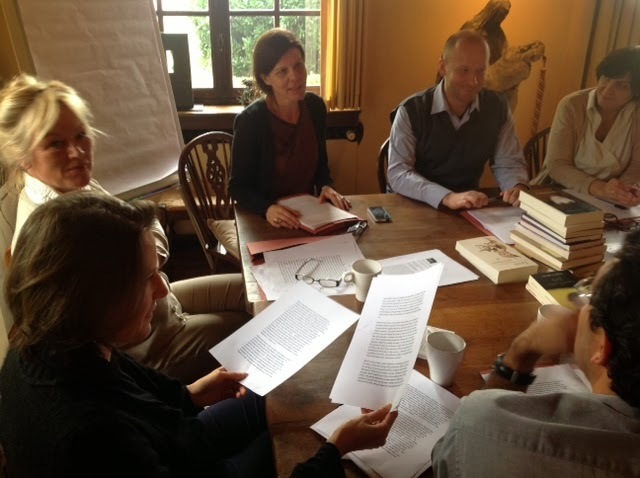 The first writers have arrived at Villa Hellebosch for the three-day Passa Porta Seminar. Ivo Victoria in Pittsburgh: dag 30. Er zijn uiteraard ook zaken waarover ik niet heb geschreven. Die keer dat ik met drie jonge gasten in een auto aan een wietpijpje lurkte. De Amish people die elke week op de farmers market stonden. Mijn bezoek aan de indrukwekkende Cathedral of Learning. Het feit dat blank en zwart in Pittsburgh volledig langs elkaar heen leven. De daklozen bij de voedselbank. De dame die me vroeg waar in Brussel precies Antwerpen dan wel lag. De tweeënzeventig flesjes bier en vier flessen witte wijn die ik de afgelopen dertig dagen consumeerde in huiselijke kring. Mijn Engelse accent dat naar verluidt op die tijd behoorlijk op dat van de Pittsburghers is gaan lijken, een beetje binnenmonds, de altijd half vragende toon, een beetje zoals Antwerps dus eigenlijk hetgeen overigens een dialect is dat verbazingwekkend goed op Portugees lijkt, luister hier maar eens naar, maar dat geldt dan weer niet voor de Pittsburgher variant van Engels die ik nu dus beheers en waaruit ik moet concluderen dat ik óf geen persoonlijkheid heb óf een extreem goed ontwikkeld talent voor accenten vermits ook mijn Vlaams nauwelijks tijd nodig had om te vernederlandsen, iets wat mij vaak wordt verweten door mensen die vorm met inhoud verwarren, het heerst, maar genoeg: Pittsburgh, ik zal je missen. Ivo Victoria in Pittsburgh: dag 29. Het zijn de dagen van de laatste keren. De laatste keer door het park naar de Giant Eagle wandelen, terwijl de herfstbladeren op grote hopen worden geblazen. De laatste keer dezelfde flauwe grap van de dame die mijn fles wijn afrekent in de Wine & Spirits. Het laatste pakje Newport Gold. Gisteren was de lezing van Laurent Binet. Ik had dat – fantastische – boek meer dan een jaar geleden gelezen en nu hij er uit voordroeg, met het accent dat je van een Fransman mag verwachten, bleek dat ik enorm veel vergeten was. Er was een zinnetje, een kort, onopvallend zinnetje, dat mij naar mijn notitieboekje deed grijpen en terwijl het vragenrondje bezig was, zat ik als een gek te noteren wat mij te doen stond, hetgeen er in essentie op neer komt dat ik dat alles waaraan ik hier heb zitten werken weer van voorafaan kan gaan herschrijven hahahaha! Daarna gingen we weer met zijn allen uit eten in een restaurant dat Lola heette. Voor vanavond heb ik een pizza in de diepvries liggen. Ja, afscheid nemen in stijl, laat dat maar aan mij over.